To define these active regions, the program operates in three phases. First, it computes an activity score for each individual genome position, yielding the raw activity profile, which is a wave function of activity per position. Then, it applies a smoothing algorithm to the raw profile, which is essentially a sort of averaging process, to yield the actual activity profile. Finally, it identifies local maxima where the activity profile curve rises above the preset activity threshold, and defines appropriate intervals to encompass the active profile within the preset size constraints. For more details on how the activity profile is computed and processed, as well as what options are available to modify the active region parameters, please see this article. 2. 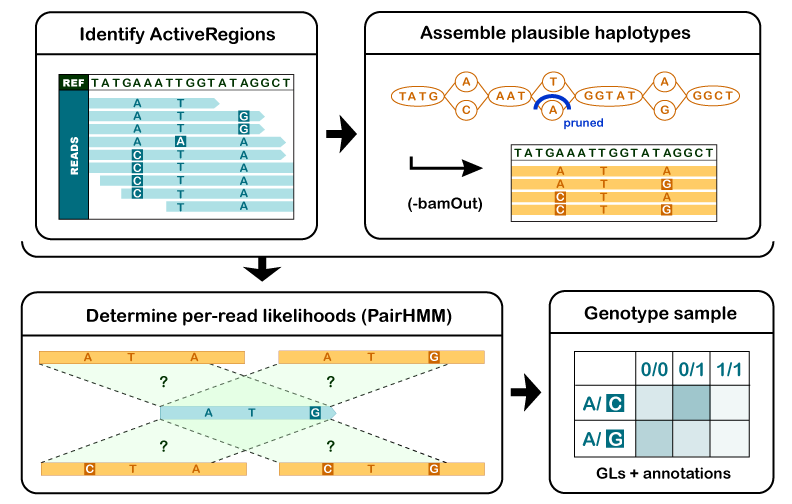 Determine haplotypes by local assembly of the active region.